A freshly hatched tadpole larva has a limbless body divide into an ovoid head, a short trunk, and a slender tail. At this stage, there is no mouth and as a result, it cannot take anything from outside. Most of the nutrition is provided by the yolk material. The exchange of gases takes place in three pairs of highly vascular and feathery external gills. 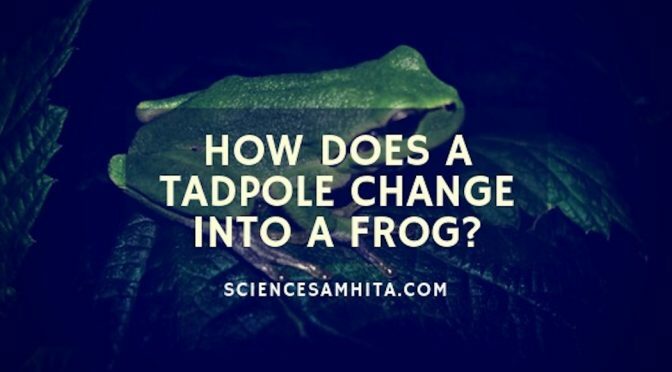 But, when the tadpole turns about two months old, a series of radical changes occur, which transforms it into a frog. These changes are referred to as metamorphosis. Metamorphosis of the tadpole larva into an adult frog is one of the most striking transformations in all of biology. It transforms a fish-like water breathing, herbivorous tadpole into a tetrapod, amphibious, air-breathing, carnivorous frog. These changes occur in external as well as internal organs of the tadpole. These changes are of two kinds: Regressive or Destructive and Progressive or Constructive. The tail of tadpole gradually shortens and finally disappears. The larval skin is cast off, and with this, the ciliated epidermis is also dropped. The horny jaws and teeth of tadpole larva are also shed along with the larval skin. The lateral line sense organs disappear. The external gills are lost and the gill chamber disappears as the opercula fuse with the skin. The new skin appears and develops flask-like, multicellular mucous glands and stratum corneum. The opening of mouth becomes wider by the backward shifting of quadrate, enabling the frog to capture large prey. The tongue grows much larger and muscular (more elastic). The premaxillary, maxillary and vomerine teeth appear. The middle ear and tympanum are developed to detect air-borne sound vibrations. The legs lengthen, become jointed and stronger, and toes appear and acquire webs between them. The lungs enlarge and become the main respiratory organs. The arrangement of blood vessels is modified from fish like to that for air breathing. The pronephric kidneys are replaced by mesonephric kidneys. The cartilaginous skeleton undergoes ossification, which continues even after metamorphosis. Also Read: How do cells in Embryo get their Roles to Play? The hemoglobin changes from the larval type to the adult type. This change is necessary because the concentration of oxygen is much lower in water than in air. The larval hemoglobin has a different primary amino acid sequence from the adult hemoglobin. The excretory product changes from ammonia to urea (ammonotelism to ureotelism) to conserve water. The pancreas starts its endocrine role by producing insulin. Larval visual pigment porphyropsin changes to rhodopsin of the adult for vision in the air. The small froglet leaves the water and becomes amphibious. It hops around with limbs, on land surrounding the water body but not so far away from water (its ancestral home). The young frog starts taking small insects, worms, and spiders with the tongue and thus become carnivorous. Respiration in young frog occurs through the skin, buccopharyngeal lining, and lungs. 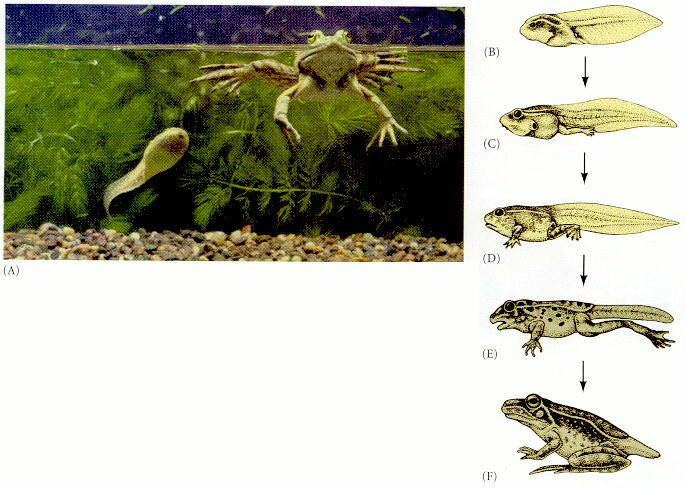 Metamorphosis in frog or we can say that the presence of a fish like a larval stage in the life history of frog provides a good evidence for the fact that the frog has evolved from a fish-like ancestor. Also Read: What are various Hormones produced by Pituitary Gland? Metamorphosis in frog and other amphibians is controlled by thyroxine (TH), a hormone secreted by the thyroid gland. In the late tadpole stage, the thyroids glands enlarge and thyroxine secretion increases. This initiates metamorphosis that occurs slowly in the beginning. Later, hormone secretion increases rapidly and this accelerates the metamorphosis. This period of rapid changes in the tadpole is called a metamorphic climax. However, if thyroid glands are removed, the tadpoles fail to turn into frogs. Whereas, if such larvae are fed on thyroid glands, even of another animal or their extract injected into them, metamorphosis starts. Kotpal, R.L. Modern Textbook of Zoology. Rastogi Publications, 2014. Gilbert, S. and Barresi, M. Developmental biology. Sunderland (Mass. ): Sinauer, 2016. Previous PostHow Enzymes speed up the chemical reactions?​Next PostWhat are different factors that affect the growth of plants?